Fifty years ago this week, the Velvet Underground released their second album, “White Light/White Heat.” Their darkest record, it was also arguably the Velvet’s most influential, inspiring a generation of alternative musicians with the noisy, distorted sound with which the band came to be so closely identified. Perhaps the place with which the Velvets have come to be most closely identified is the Electric Circus, the Andy Warhol-run East Village discotheque where they performed as the house band as part of a multi-media experience known as the “Exploding Plastic Inevitable.” Many New Yorkers would be surprised to discover that the space the club once occupied at 19-25 St. Mark’s Place has since been home to a Chipotle and a Supercuts. But the history of the building that launched the career of the godfathers of punk is full of more twists, turns, and ups and downs than one the Velvet’s extended distorted jams that once reverberated within its walls. Perhaps no single photographer could be said to have captured the energy, the cultural ferment, the reverberating social change emanating from New York City in the second half of the 20th century as vividly as Fred W. McDarrah. McDarrah got his start covering the downtown beat of the Village Voice in the 1950s and ’60s, as that publication was defining a newly-emerged breed of independent journalism. 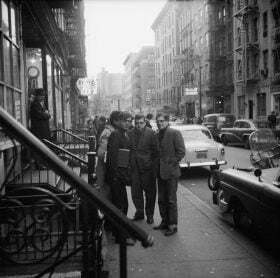 McDarrah penetrated the lofts and coffeehouses of Lower Manhattan to shed light upon a new movement known as “The Beats” and went on to capture on film the New York artists, activists, politicians, and poets who changed the way everyone else thought and lived. 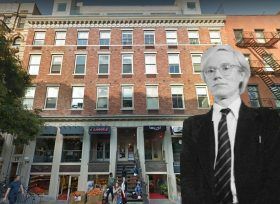 Through the generosity of the Estate of Fred W. McDarrah and the McDarrah family, the Greenwich Village Society for Historic Preservation was fortunate enough to add to its digital archive a dozen of the most epochal of Fred McDarrah’s images of downtown icons, including Andy Warhol, Bob Dylan, Jane Jacobs, and Allen Ginsberg. And just in time for the holidays, you can purchase your own copy (with all proceeds benefitting GVSHP! ).